A break of the 1/05/18 session high (987’6) triggers an entry to the upside. The futures margin requirement and the potential risk are relatively high; let’s anticipate the breakout by entering a bull call spread position. This strategy will reduce the risk and require no margin requirement. The potential stop loss is a break of the recent lows near 966’0. 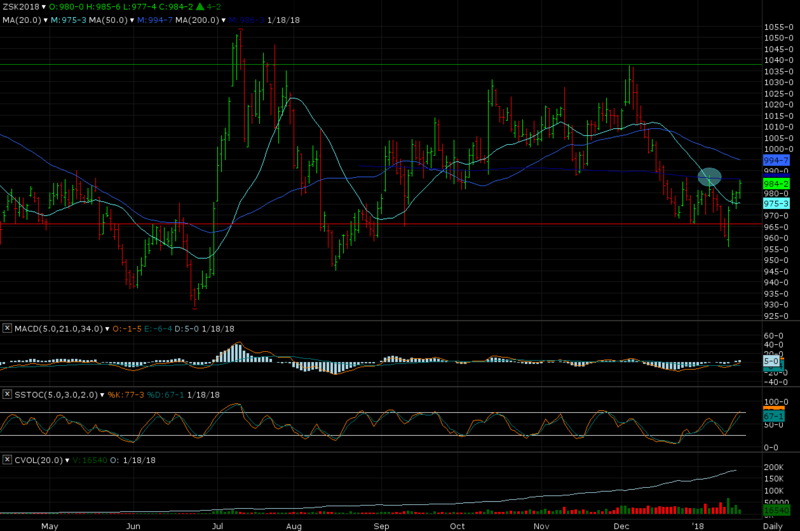 The potential upside target is the potential resistance level near 1035’0. Purchase: May 2018 Soybean 980/1040 call spread on 17’0 cents or $850, GTC. Maximum Risk: $850, not including commissions & fees. Maximum Profit: $2,150 ($3,000 – $850), minus the commission & fees. Expiration: April 20, 2018 (92 days). No margin requirement. This is a sample entry from Don DeBartolo’s email newsletter, Trade Spotlight: Options, published on Thursday, January 18, 2017.